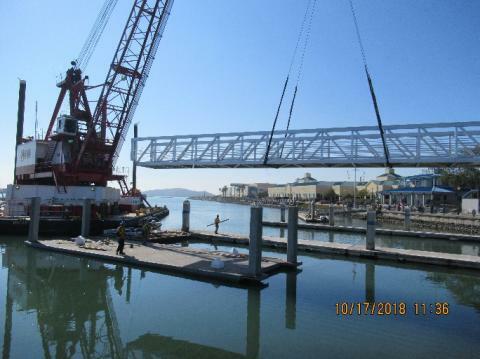 December 21: Work this week included installation of lattice gate to maintenance catwalk; continued removal of falsework; internet connection and communications to CBOMF; bird-safe Glass wall installation nearing completion; completed installation of louvers. Caulking of joints in roofing fascia beam was also completed as well as: removal of the last of the contaminated soil; installation of fire extinguisher cabinets and life ring; artists poured and finishes about 80% of their concrete; installation of National Park Service interpretive sign and Water Trail signs. 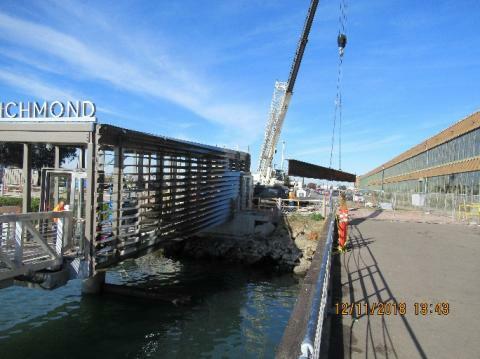 December 14: Work this week included riprap installation at shoreline beneath passenger shelter and continuation of 42” high glass guardrail installation. 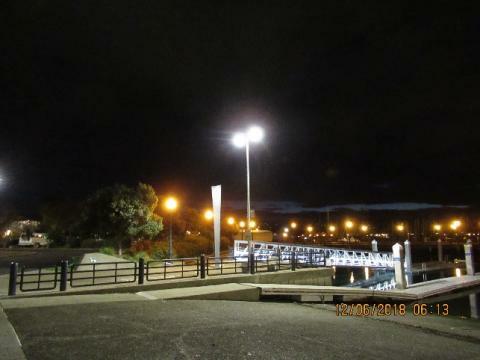 Electrical work: Shore power connection, float lighting, doors / security systems and attempted restoration of street lighting along East side of Harbour Way South. Landscaping work included installation of irrigation system and new sod for triangular grass plot next to plaza area and general site maintenance. Removal of scaffolding and partial removal of the falsework that were used to install the louvers. 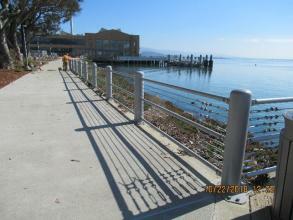 Continuation of refurbished bollard guardrail installation. 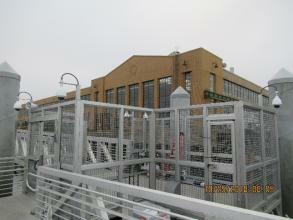 Reopening of lots 1 and 3. 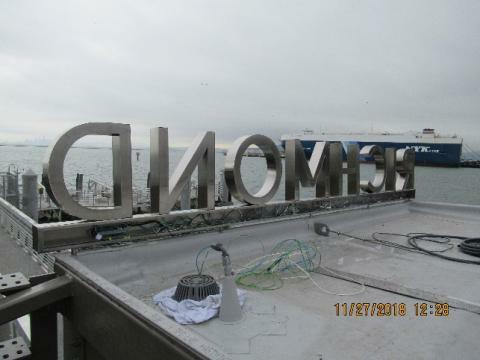 December 7: Work this week included completion of work on kayak Launch except for signage and completion of louver installation except for six sections that need minor modification. 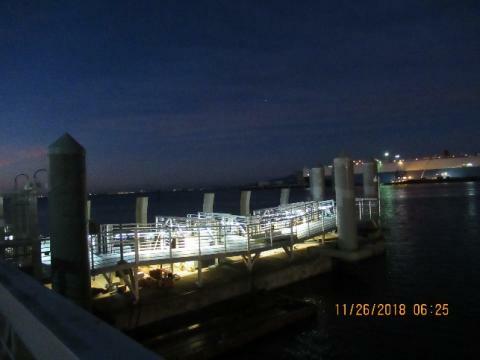 Electrical work continues with installation of motion sensors and connections to electrical cabinets and the navigation lights. 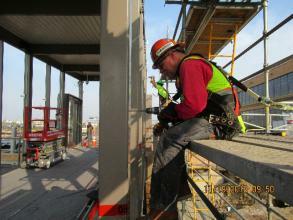 Work installing brackets for glass guardrail in passenger shelter. November 30: Work this week (and Thanksgiving week) included storm water pollution prevention measures were inspected and maintained in anticipation of the inclement weather. 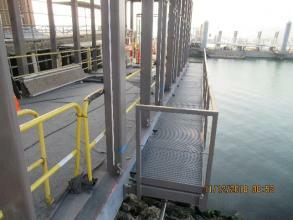 Transition plate at top of gangway was re-installed. “FERRY” and “RICHMOND” lighted letter signs installed on top of passenger shelter. 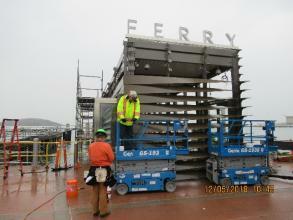 Installation of louvers is proceeding with about 25 sections installed despite the wind and heavy rain on Thursday. Door pulls and panic bar installations are nearing completion. 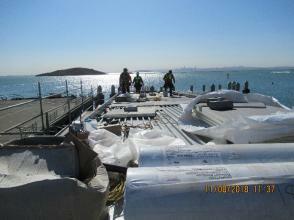 Domestic waterline on was float modified to accommodate electrical system components. 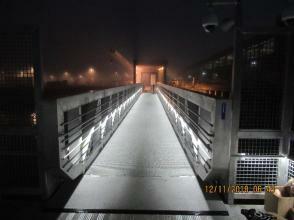 Kayak launch area electrical work including overhead light is complete other than final testing. 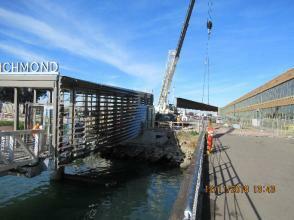 Wash down of Sheridan Point viewing deck has occurred. 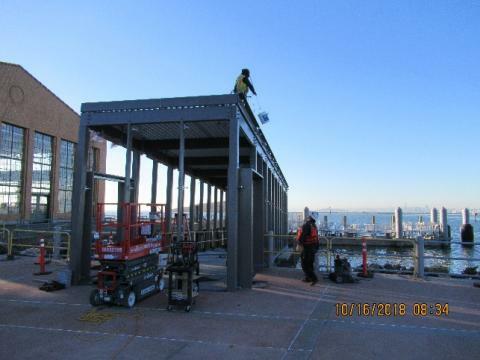 Roof installation on passenger shelter is complete other than patching around electrical penetrations for lighted letter signs. November 16: Work this week included continuation of electrical work on float and in the passenger shelter including cable terminations at the electrical and data boxes. 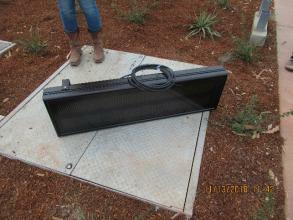 Installation of the protective cages for backflow preventers. 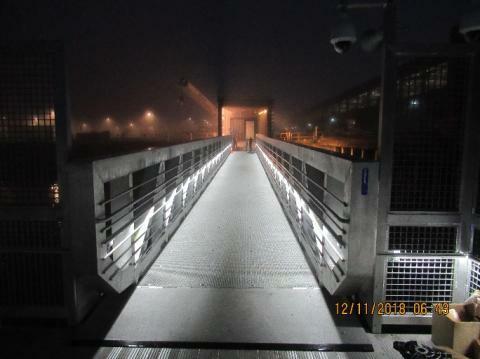 Layout and marking for louver installation.Completed installation of the grating on the maintenance catwalk along the West side of the passenger shelter. Continuation of roof membrane installation. Landscape work this week consisted of continued adjustment of the irrigation system and some maintenance weeding.Parking area entrance signs were installed. Cubic representatives were on site to discuss Next bus sign installation. November 9: Continuation of refurbished bollard railing installation along the south waterfront. Electrical work this week included continuation of work inside roof area, conductors for the access keypads and doors and terminations at float panels and transformer. 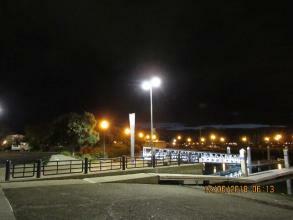 Parking lot lighting is now fully functioning and energized. Glazing work included glass for the doors and continued installation of hardware for supporting the glass in the structure. The north boundary fence was completed this week. 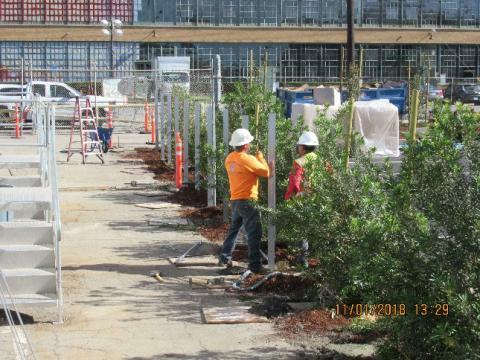 Landscape work included removing/disposing of unsuccessful trees, moving the “unknown” trees to the NW corner of the site and installing new eucalyptus trees wherever trees were required but were not yet installed. Tree installation is complete. Scaffolding/staging has been constructed in preparation for the start of louvers installation next week and the first delivery of louvers has arrived on site. Most of the parking are signage has been installed and the pavement markings in support of the Kayak launch were completed. 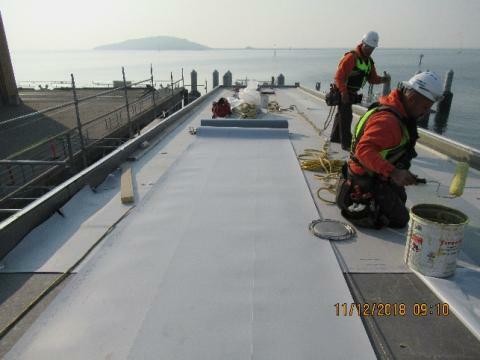 Installation of the waterproof roof membrane on the passenger shelter has started. 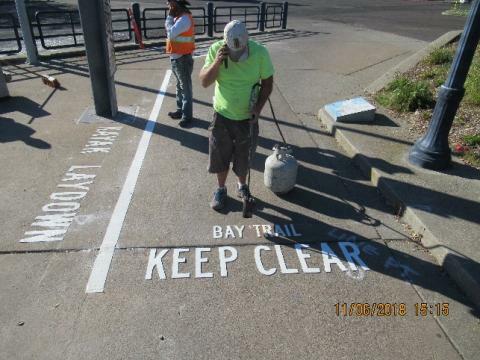 November 2: Work this week included: Fix kayak launch trip hazard. Install door mechanical hardware for passenger shelter. Electrical work on float and in passenger shelter and in parking lots including installation of the transformer, conductors for the doors and conductors for parking area lighting. 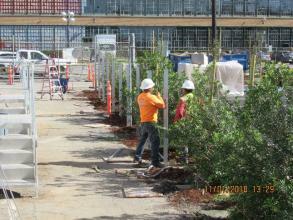 Installation of footings and poles for fencing at North Boundary. Install terminal Gangway safety chain. 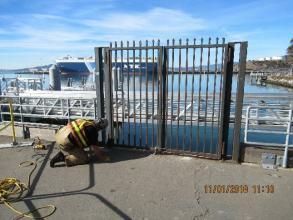 Remove old gate alongside Bay Trail. 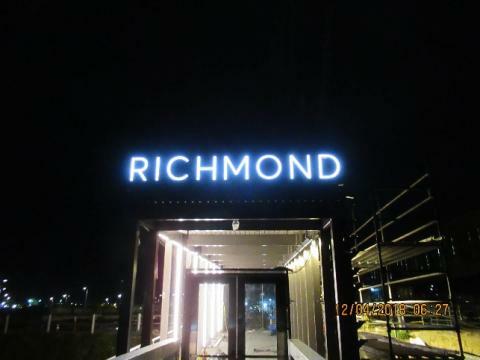 Receive lighted letter signs and parking area signs. 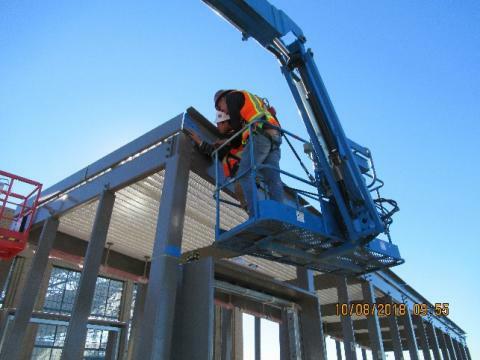 October 26: Correction of parking lot punch list items, application of joint sealant in completed concrete and turning on some parking lot lights. 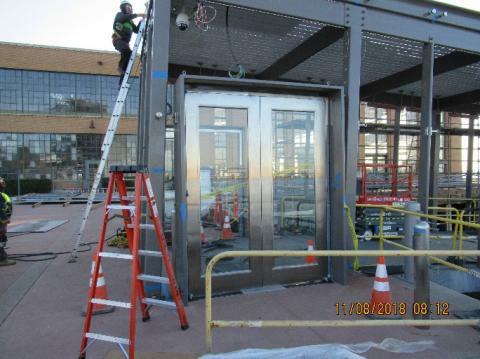 Door installation for Passenger shelter. Continuation of bracket installation for the shelter glazing. 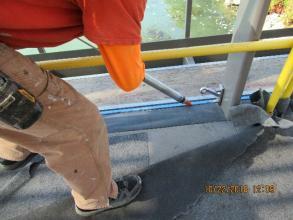 Completion of installation for Kayak Launch appurtenances and safety stripe. 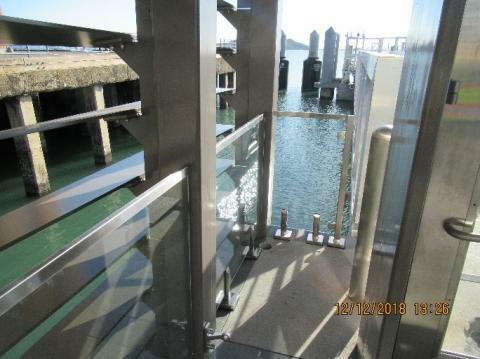 Continued installation of the refurbished bollard railing along the Southern edge of the project and the new boundary fencing at the North edge of the project. 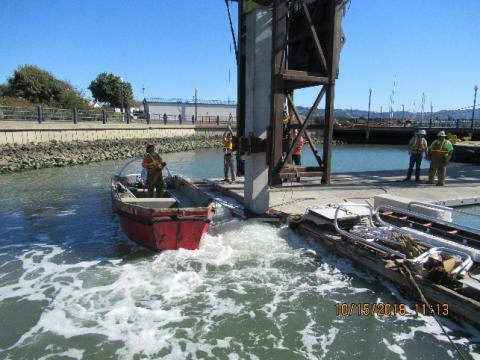 October 19: The kayak launch has been installed except for the electrical and modifications to the guardrail at the gangway. 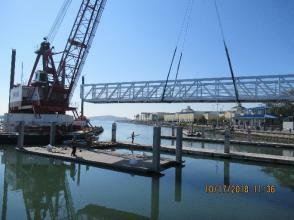 Electrical work on the Float, Gangway and passenger shelter roof continued this week. Cameras and PA speaker mountings have been completed in the shelter. Touch up epoxy paint continues on passenger float. Star benches and strata benches have been installed. Removal of plastic “zip strips” and application of joint sealant for concrete work has started in the Lot 3 area. 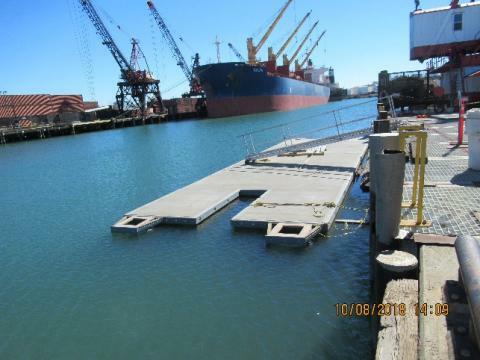 October 12: The big news for this week is issuance of substantial completion for Lot 2 which was reopened to the public. 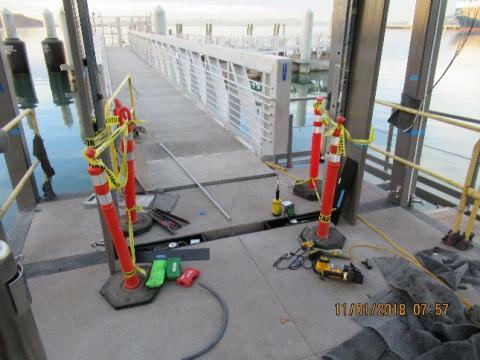 Electrical work on the Float Gangway and passenger shelter continued this week with installation of conduit and electrical panels. 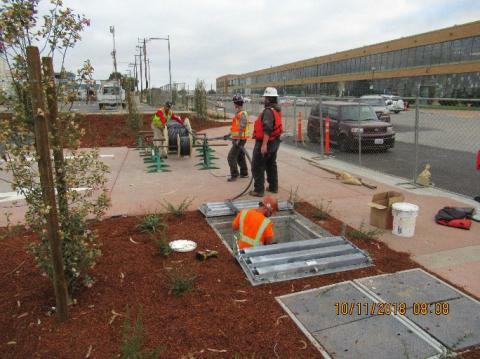 Site electrical work involved pulling conductors between the PG&E panel and the Shelter, site lighting and irrigation controllers. Glazing work on the passenger shelter involved placement of the bracket hardware to hold the glass along the West, North and South walls. The refurbished railing along the South shoreline continued this week with new bolts placed and cable railing between the bollards in the viewing area. Parking lot and landscaping punch list items have started with additional wood mulch, replanting “failed” trees and ground cover, corrections to parking lot striping general clean up. The Kayak float has been assembled and is ready for installation next week.